Fitted wardrobes will instantly create more space and can be tailored to your room and lifestyle. Desperately seeking more storage space in your bedroom? You’re not alone. Wardrobes across the UK are bursting with clothes, shoes and whatever else we can cram in. Freestanding wardrobes compound the problem because they don’t make the most of space or allow for customisation. A simple way to boost your bedroom storage is with built-in wardrobes. They instantly create more space – three times more, to be exact – and are available in sizes and finishes to suit all sorts of spaces. Read on to discover what you need to know before installing fitted wardrobes. 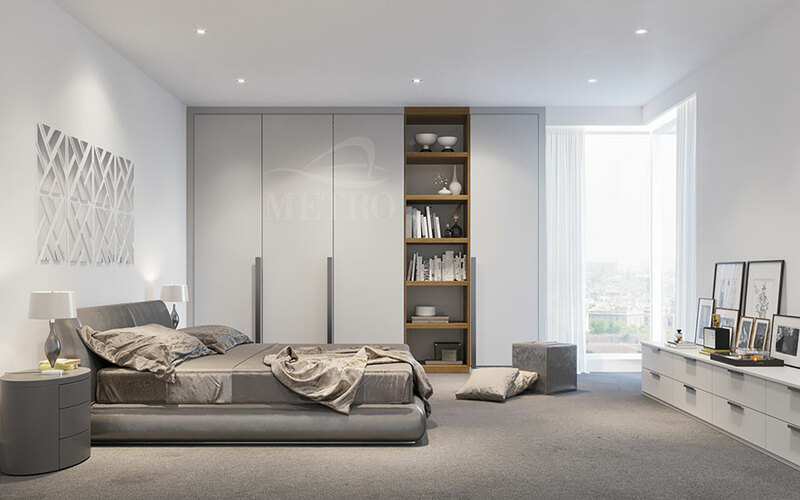 Discover our contemporary wardrobes from the Milan range by Metro Wardrobes. Our fitted wardrobes allow you to tailor solutions to suit any space requirements and individual needs. Our Hinged wardrobes, open shelves and chest of drawers start from £3,000 including VAT and fitting. Freestanding wardrobes have gaps above and to the side that are crying out to be filled with knickknacks and dust. In contrast, fitted wardrobes can be tailored to fit the full height of the room. Even if a bedroom is an awkward shape, a fitted wardrobe can turn even the tightest corner into a workable home for belongings. 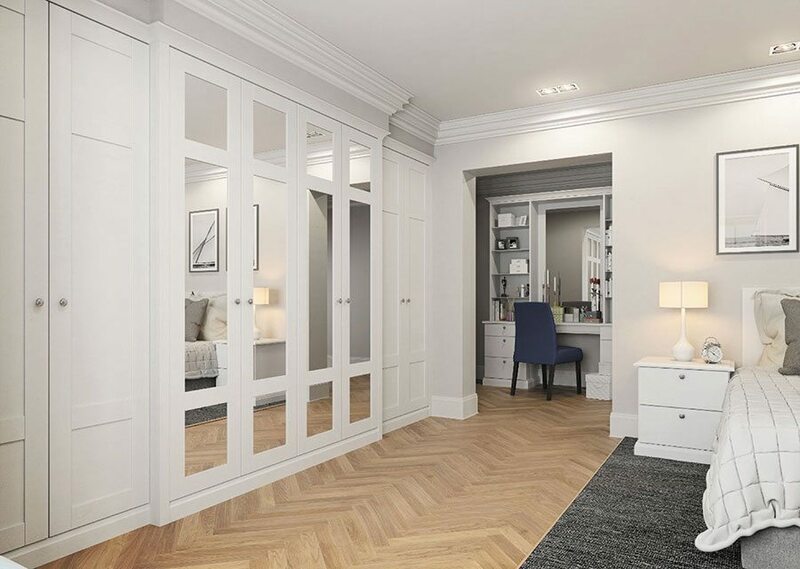 Newlands by Daval features an impressive width of framed wardrobes with integral full-length mirrors. Built from sustainable materials, every bedroom by Daval is made to order. Prices start from £3,000. Now for the bad news. Unlike a freestanding wardrobe, you can’t take a fitted wardrobe with you when you move house. However, there’s a silver lining, says Matthew Nagel, director at Neatsmith. “Your investment is always recouped when you sell your house because of the premium that buyers put on storage, especially in London homes,” he explains. Frameless white glass Cloister doors with a walnut interior by Neatsmith priced £1,000. Cloister doors are made to measure and can be up to 2800 mm high and 1200mm wide. There’s an excellent choice of companies offering fitted wardrobes at a variety of price points. These range from mass-market retailers, such as Homebase and B&Q, to fitted furniture specialists such as Neville Johnson. If your budget allows, a bespoke furniture company will design and hand make wardrobes to suit your space and style. It’s costly, but the benefit is that you won’t have to adapt your ideas to an off-the-shelf solution. 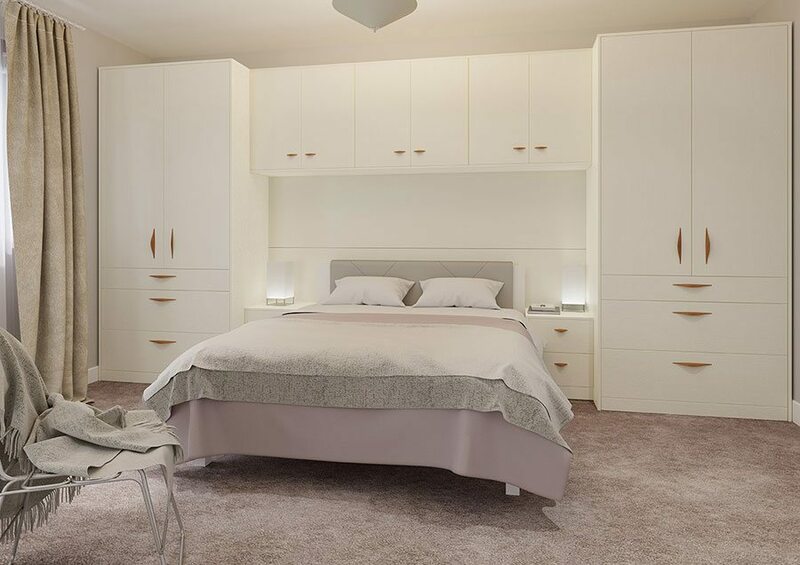 Creating a light and airy bedroom, Locano Touch by Crown Imperial is pictured here in a timeless cream with contrasting sleek walnut handles. Prices start from £500. Irrespective of where you buy your fitted wardrobes, always ask friends and family for recommendations. Read online reviews too, and make sure you visit showrooms to see and feel the quality of the products. Go to at least three to narrow down your options, and don’t be afraid to ask questions what companies offer. If you opt for a bespoke furniture company or a local carpenter, ask to see a portfolio of their work. Ideally, visit previous projects and use the opportunity to chat to the homeowner about the company, its service and how problems were handled. If you want to keep things simple, choose a company that will manage the work from concept to completion, and that will help with design and installation. This can avoid costly mistakes as well as stress. 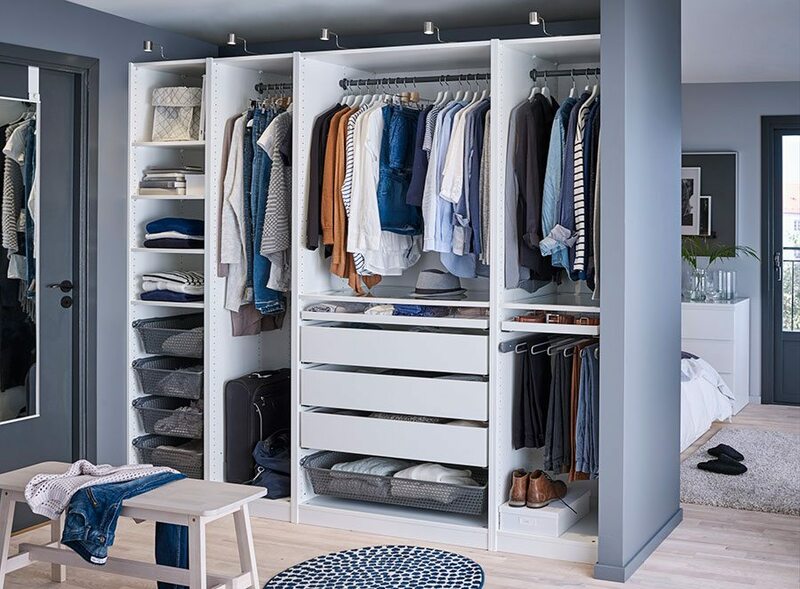 Given that fitted wardrobes are a long-lasting solution, it’s essential you choose a future-proofed option that you know will still suit your personal taste in years to come. 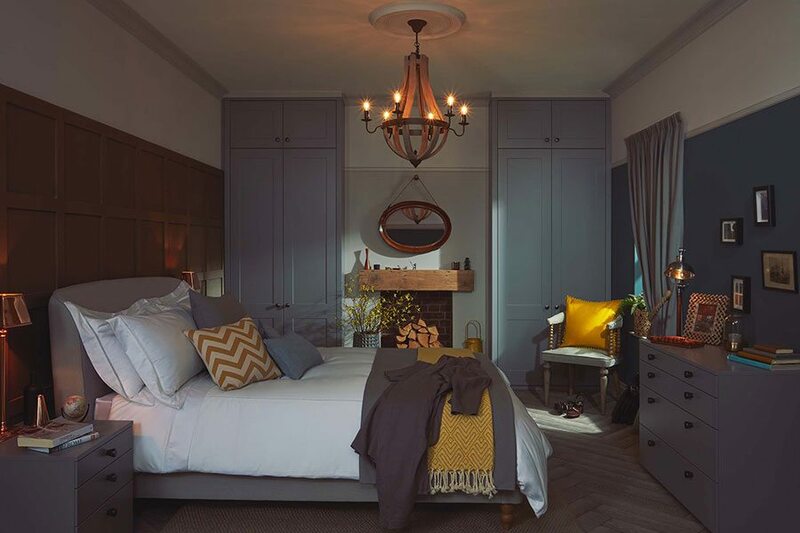 “We’d advise determining the colour palette of your room before you start adding different furniture elements,” advises Rachel Hutcheson of Sharps. 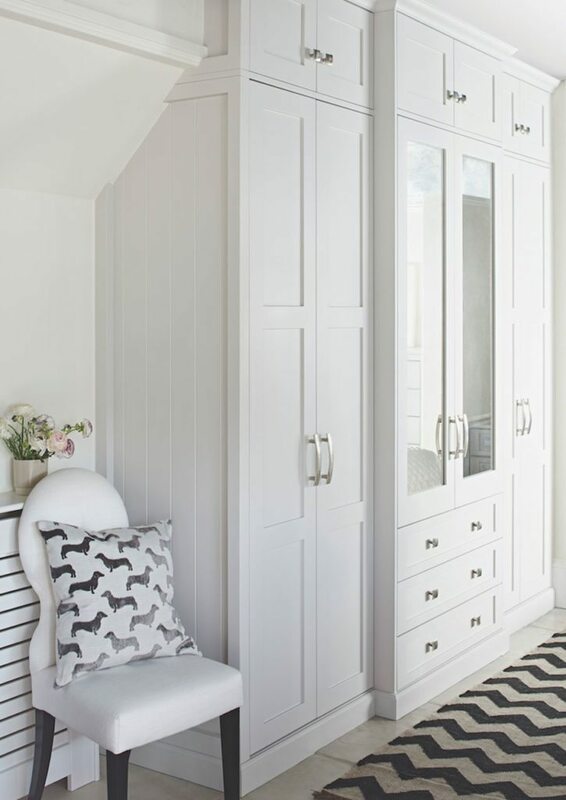 Seen here in white, this Shaker-style in-frame fitted wardrobe, priced from £5,000 from John Lewis of Hungerford blends beautifully into the bedroom. Think about the size and shape of your bedroom as well as your personal preference when you’re choosing wardrobe doors. If you’re short on space, opt for sliding or bi-fold doors so you don’t need as much room for them to open. 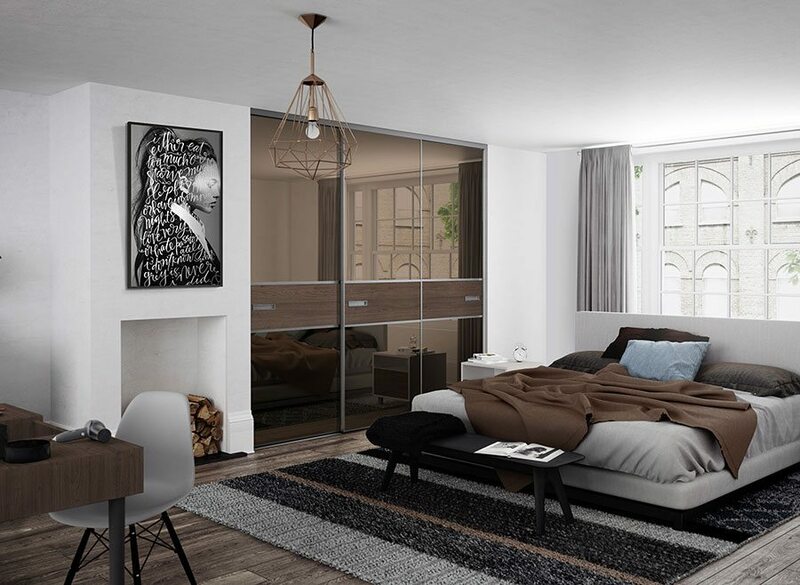 Small bedrooms also benefit from mirrored doors, as they create the illusion of a larger room and provide a full-length mirror without taking up valuable floorspace. 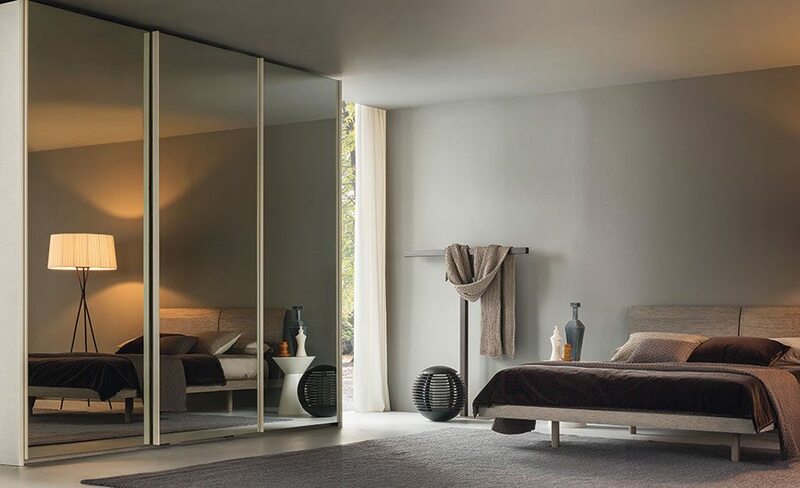 The bronze mirror finish of the Premium Mini Sliding Doors from Spaceslide will reflect light around the room and create the illusion of space. Prices start from £510 and include design and manufacture. Before you start on your fitted wardrobe project, you’ll need to take some measurements. First, determine what the ceiling height is at both ends of the room as well as the middle. This will reveal whether or not the wardrobe needs to accommodate a sagging ceiling. Fitted furniture specialist Neville Johnson strikes a traditional vibe with this bespoke oak wardrobe starting at £3,000. Does the room include coving or skirting boards? If yes, then ensure you provide the dimensions of any fixed details that are protruding. They’ll alter how the back of your wardrobe is designed, so must be accommodated to make a flush, tailor-made finish. Do any electrical plugs need moving before installation? “If moving an outlet is just not possible, then bespoke fitted furniture will provide a solution to conceal unsightly wires, cables or controls for integral lighting as well as maintain easy access. Just make sure you mention these requirements at time of concept,” says Simon. The matt finish coupled with subtle contours adds to the sophistication of the Esker range from Kindred. Prices start from around £2,500 for a small bedroom set including two double wardrobes and a set of matching chests. The Signature storage system from Spaceslide is shown here in Wild Wood and Cashmere. Made to measure, it’s priced from £306 for design and manufacture. The inside of your wardrobe must be as beautiful as the outside. Make sure you choose a company that offers the right range of options for your specific storage needs. “Whether you have an abundance of tailored suits or a passion for the occasional Jimmy Choo, there’s a variety of hidden-away or display options to suit you and your lifestyle,” says Simon. Ask about hanging rails, shoe and trouser racks, and specialist pull-out shelving to suit your needs. Some companies also offer space for media devices and integral illumination. Customise your closet for less at Ikea. Shown is the Pax wardrobe, £435, which can be tailored to your needs with Ikea’s Komplement series. Also featured is Urshult LED lighting, £21.